Live, Work, Play. This is the Avalon Park motto. You will love living in Avalon Park with amazing schools, numerous dining options and great shopping. Avalon even has it's own Publix and YMCA! Convenience and amenities galore make this a must see! This Two story pool home has hardwood flooring in all areas downstairs for easy care and neutral carpet upstairs. 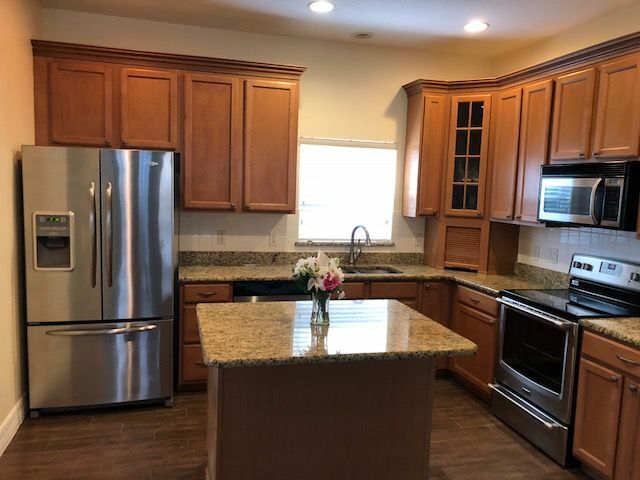 The beautiful Kitchen features upgraded cabinets and an upgraded appliance package: stainless steel appliances with French drawer refrigerator, built-in microwave, smooth-top range, dishwasher and disposal. The Kitchen directly connects to the Great Room for an open layout. Downstairs there is also the formal Dining Room, separate Living Room, Laundry room and a Half Bath. Upstairs are all of the bedrooms and two baths. The Master Bedroom has a lovely view of the pond across the street from the home and opens to the beautiful Master Bath featuring double sink vanities, soaking tub and beautiful walk-in shower. If you need closest space, this master is great for you with two closets! All bedrooms have ceiling fans and upgraded light fixtures. The outdoor space is a great component of this house and you will probably find yourself rocking on the front porch in the afternoon, or on the back patio overlooking the beautiful, sparkling pool. There is ample car parking with the home having a two-car garage accessed in the rear. The Avalon Park community offers many amenities including ball parks, volleyball courts, playground and pools. Enjoy running or walking through the community on the large sidewalks and jogging paths. If Avalon Park’s restaurants and shopping are not enough for you, very close by is Waterford Lakes which has even more wonderful shopping, restaurants and groceries. This area has sought after schools for an added bonus. Basic Pool service is included in the rent.